Salisbury City have issued a plea for new investors to help sustain the club in the Conference Premier next season. Major backer William Harrison-Allan says they are running at a loss because of low crowds and a lack sponsorship and commercial activity. 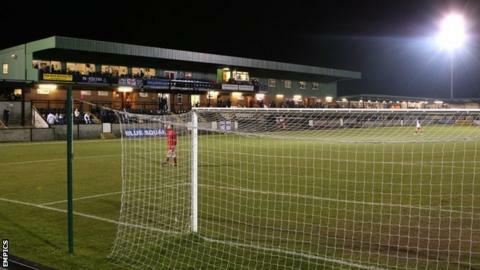 The Whites, who are 12th in the league, came out of administration in December after five years of financial turmoil. "It's not about the shortfall this year, it's about planning for next year," said chairman Harrison-Allan. He told BBC Wiltshire: "We've got no winding-up orders or anything at the moment but we've been down on fans this year and I need someone to come alongside me and help, or take over. "The cost of competing in the Conference Premier is substantial. Our budget is around £400,000 for players but there's two [clubs] with £2m and lots around the million-pound mark." Salisbury signed a three-year repayment plan with Revenue and Customs in 2008 to avoid being wound up, but they were handed a double demotion from the Conference Premier a year later after missing a deadline to pay creditors. Harrison-Allan was part of a consortium, alongside Chris Brammall and Jeff Hooper, who took over the Whites in the 2009-10 season and inherited debts of £750,000. The new board helped restructure the club's finances in the Southern League and despite their financial plight, the Whites came back up to non-league's top flight as play-off winners last term. In December, the club fulfilled their obligations under the Company Voluntary Arrangement to come out of administration. But home crowds have dwindled to an average of around 900 - below their 1,300 target - and they recently gave away 10,000 free tickets to local school children to boost attendances. Mikey Harris's Salisbury side had been in play-off contention since September but are now seven points off sixth place, with five games of the season remaining. "If we're going to go for League Two we have to upgrade our ground and if we want to compete at a high level, you need money behind you," added Harrison-Allan. "If there's not the support then we will probably struggle to stay in the Conference Premier. We'll always be bobbing around at the bottom."